Fine-grained marble, Pentelic. Archaistic variant from the imperial age after a Greek original of the second half of the 5th century BCE. Height 45 cm. Saint Petersburg, The State Hermitage MuseumInv. No. A. 407. Unknown; from the Campana collection, acquired in 1861. The head of the god is reminiscent of the Hermes Propylaios by the Greek sculptor Alcamenes. 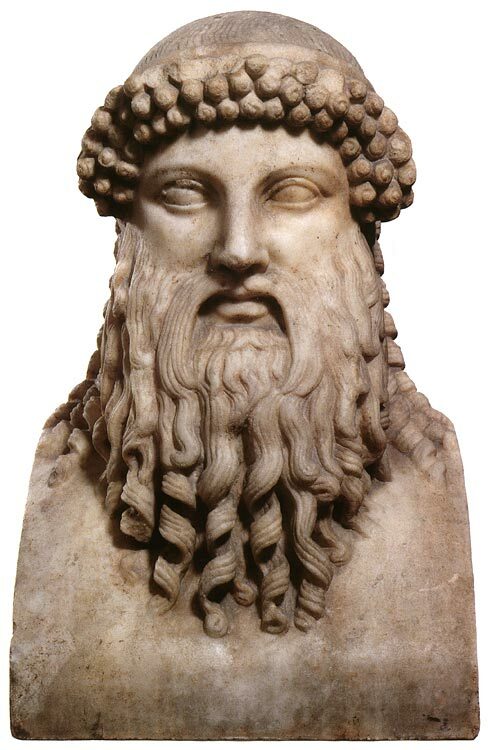 We possess a series of heads which resemble the original: in Munich, Ephesus, Pergamon, St. Petersburg, Berlin and Rome, but it is difficult to say which resembles it most closely. Copyists may have accentuated or underplayed the archaistic aspect of Alcamenes’ work. Today, there is a preference for the Munich-Ephesus-St. Petersburg type. An epigram on the Pergamon copy tells us: “You see here the finest head of Alcamenes, Hermes before the Gates”. Another copy, that of Ephesus, was found at the entrance to a room of the gymnasium. The formalism of the hair is striking: the forehead is framed by three rows of coiled curls; on the head, the hair has been worked, above the headband, in the form of an “S”. Curls fall on the shoulders. The eyes are fairly wide apart, framed by accentuated lids. The general aspect of the head is somewhat hieratic. O. Waldhauer, Die antiken Skulpturen der Ermitage (Berlin, 1931) no. 49 p. 64, pl. XXXVII. I. Saverkina, Greceskaja skulptura (Leningrad, 1986) no. 38 p. 96. © 1993. Photo, text: Olympism in antiquity. Olympic Museum Lausanne. Bertelsmann UFA. Industria Gráfica S. A. Barcelona, 1993, p. 61 cat. no. 4.